Are you searching for a productive means to showcase your writing skills/work and also to cultivate a large fan base? So what if books and newspapers have gone out of fashion? 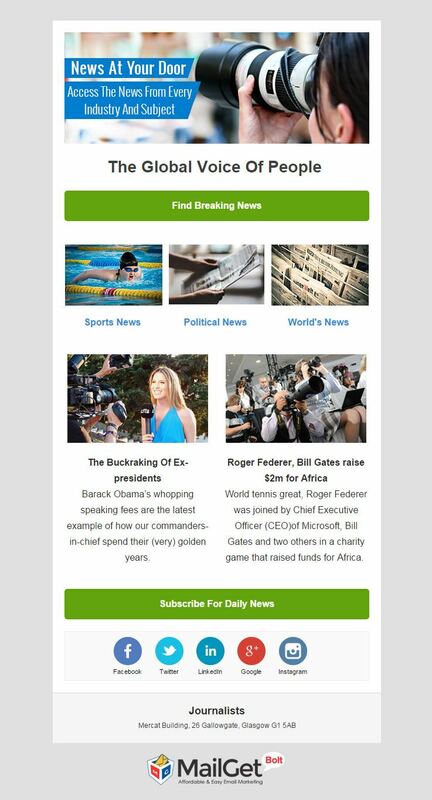 Your readers/fans can still read using e-books and e-news. But for those e-books to flourish, the publication agencies needs skillful writers and authors. So, to embark your journey of success, we recommend you to start publicizing your work by sending attractive email templates with the help of associated email marketing service i.e. MailGet Bolt. Saving up your funds as it is highly cost effective. Reaching large audiences because of its responsive nature & 99% delivery rate. Reducing your workload as it is fully automated. 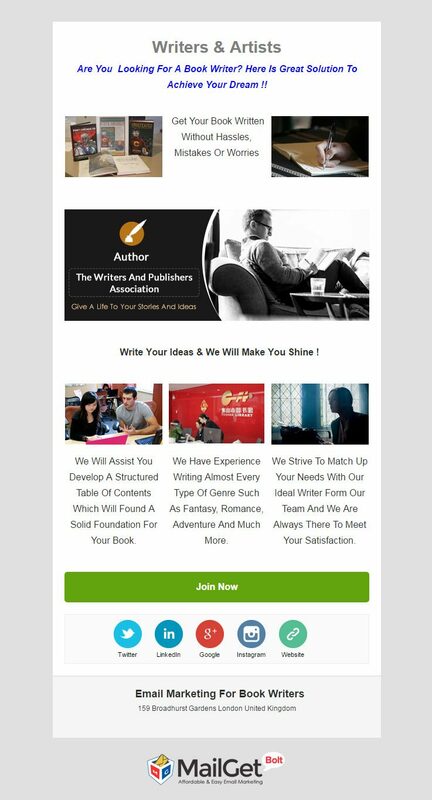 In order to jumpstart your writing business, we have compiled up a list of best author email templates for you to choose from. 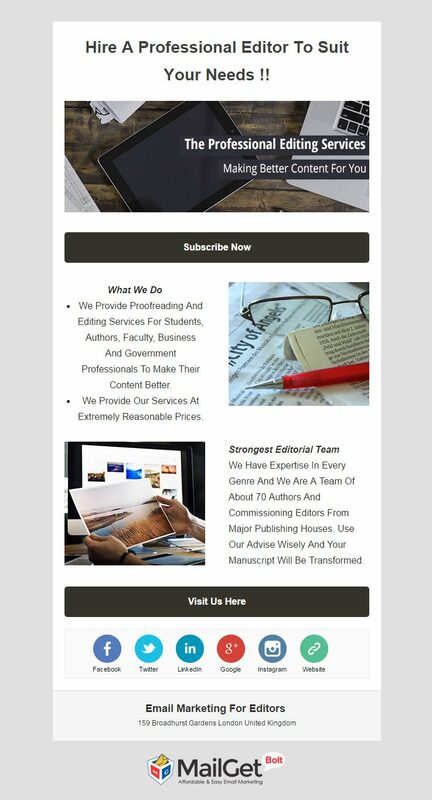 Enhance your writing business by learning the basics of email marketing through 12+ Best Author Email Marketing Services For Publishing Houses, Writers & Read Reviewers. 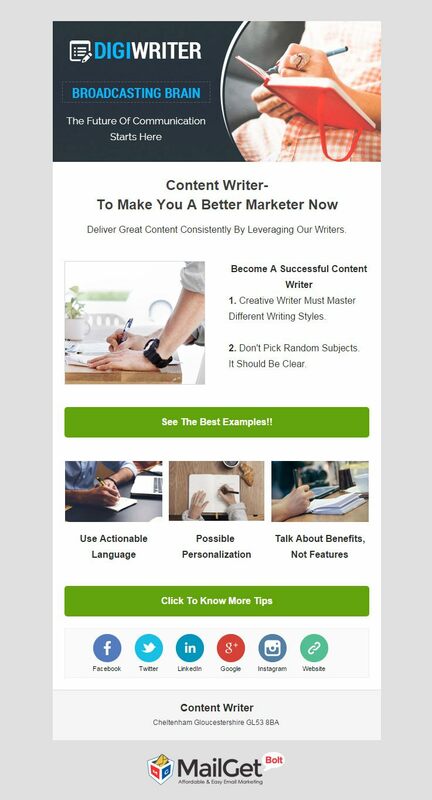 Prepare to become a highly prolific copywriter with the help of this email template. The template is crafted with the help of a powerful tool, drag & drop email builder. This email builder facilitates you to drag the required fields (text, images, buttons, etc.) and place them in the template’s layout. This tool allows you to quickly create multiple templates and also adds a lot of charm to it. 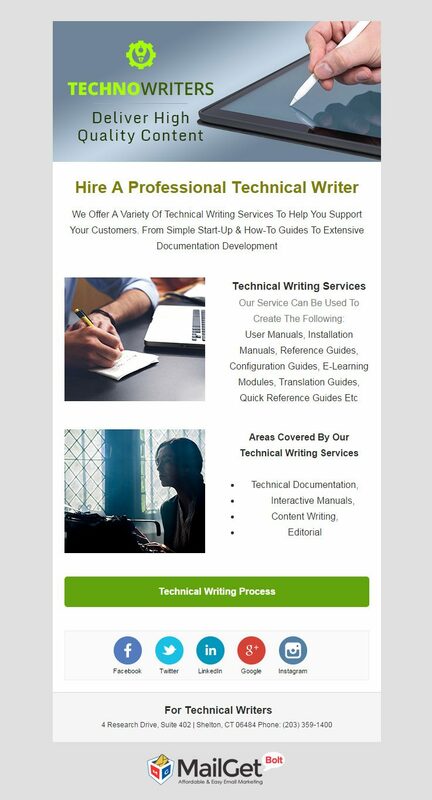 This email template has been crafted with the sole purpose to uplift your content writing or blogging business. The e-template has been packed with many CTAs or Call to Action buttons, which would redirect your readers back to your website or portal. This increases the traffic on your website and also promotes user activities. 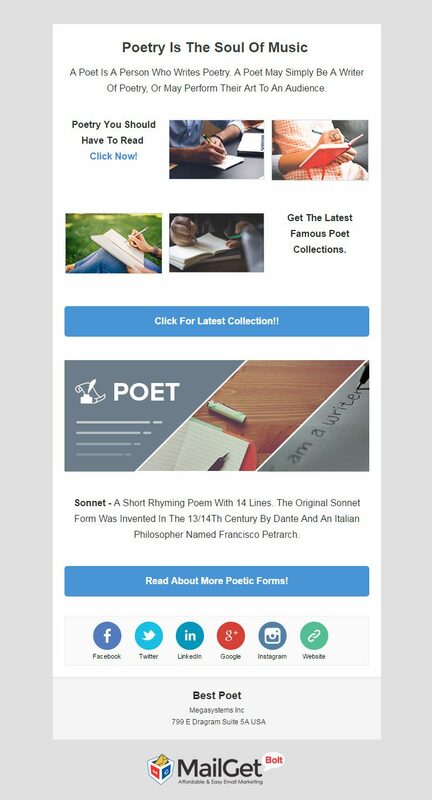 Just like you mesmerize your listeners/readers with your poetry, you can also dazzle them with attractive email templates. One such captivating e-template is this one as it isn’t just visually attractive, but it also provides you the option of inbox previewing. Now can very easily send a demo or short versions of your poetry and also view how it would appear at the recipient’s end. Begin writing the story of your success by sending email templates to various employers and agencies, in order to promote your skills and work. The advertising process will surely yield higher results as the template is transmitted with 99% delivery rate. With this much delivery percentage, you can reach out to the maximum number of people. 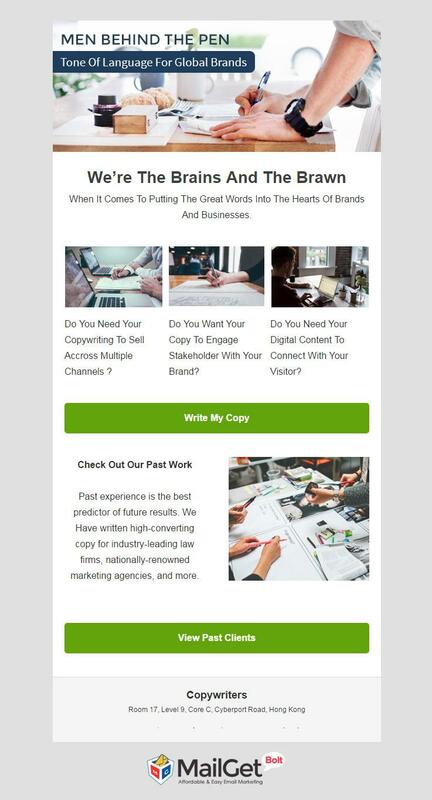 Prepare to come in the limelight by sending email templates to various companies and agencies, in order to showcase your content writing skills. You can monitor the actions of your recipients with the help of email tracking feature, enabled with this template. The open, clicked and unsubscribed rate will help you in devising effective marketing strategies. 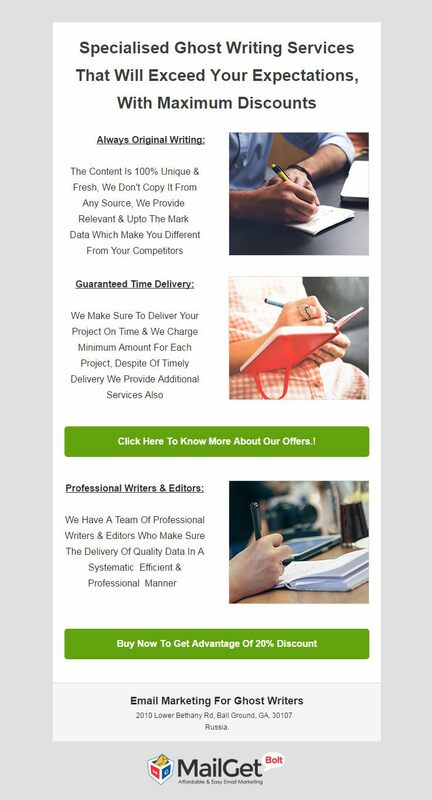 The mass transmission of this email template guarantees effective promotion of your editing services and expertise. The e-template allows you to get back in touch with your recipients, who failed or ignored your first sent email template with the help of auto follow up emailing feature. This amenity provides your skills the maximum exposure as it helps in increasing the open rates. Just as you are known to create content for technical purposes, you sure are wanted by selective companies and publication houses. In order to filter out your emailing list, the subscriber segmentation function helps you to create various distinctive email lists, according to their corresponding needs and requirements. Make a sales pitch about your journalism and article writing skills that your potential employer cannot refuse, with the help of this email template. The e-template can be sent with either regular campaign or with drip campaign. The only thing that you have to take care in drip emailing mechanism is, you have to set a triggering date/time on various email templates so that it can begin its transmission at regular intervals. Being a highly skilled content administrator, you need a powerful promotional tool to broadcast your skillset. Hence, this email template fulfills your every promotional requirement and also allows you to focus on other tasks as well since it allows email scheduling. With this feature, you can set a transmission schedule so that it gets delivered to your clientele at the right time, hence increasing the chances of email opening. 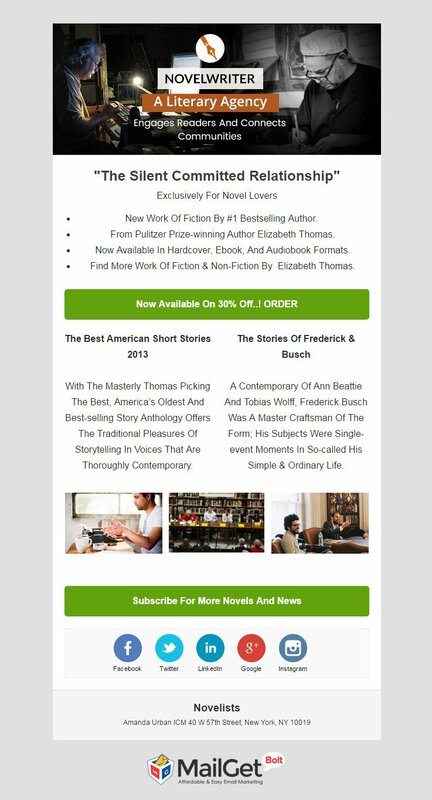 Promote your short stories and also your writing skills by sending lucrative offers via email templates. The e-templates also provides you an option of embedding a subscription form in your template’s layout. Through this form, you can generate enough leads in order to convert them into a fan/employer and to foster a healthy, loyal relationship with them. Tempt your potential employers to avail your services and subscribe to your newsletters by sending them descriptive email templates. The template provides you a wider shareability options as it is integrated with an array of social media icons. This ensures effective brand promotion on different platforms. 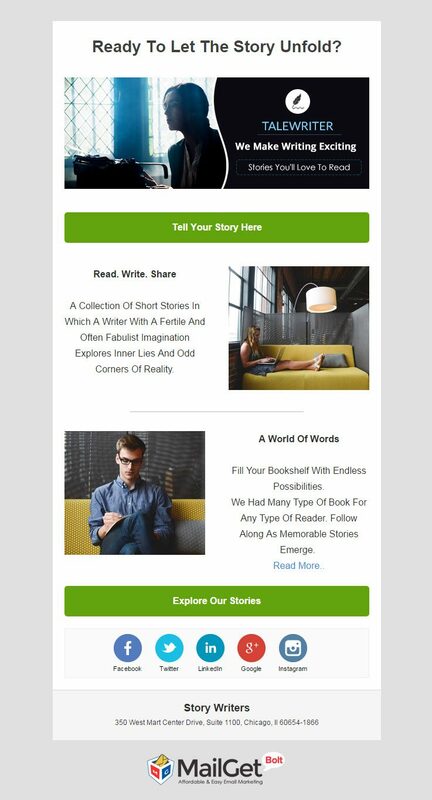 Increase the reach of your story & novel writing skills with the help of this powerful email template. The template can be sent as an autoresponder email, which is activated when there is an action taken by a reader on your website like signing up for your updates, novel purchasing, etc. 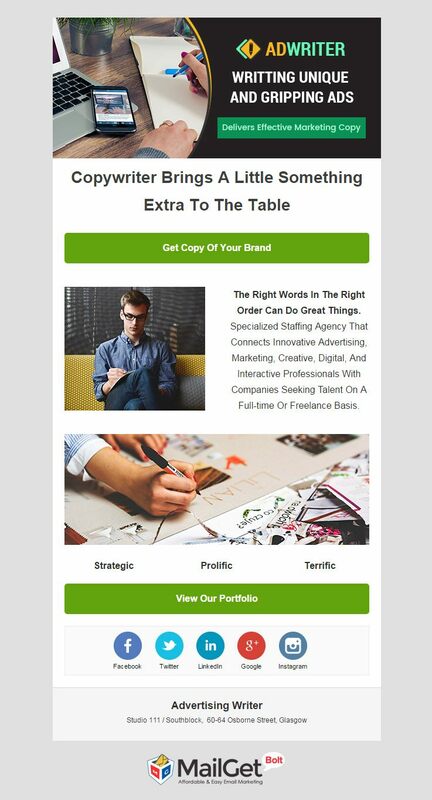 You can also give a personal touch to these email templates by including names of every recipient, using personalized tags. 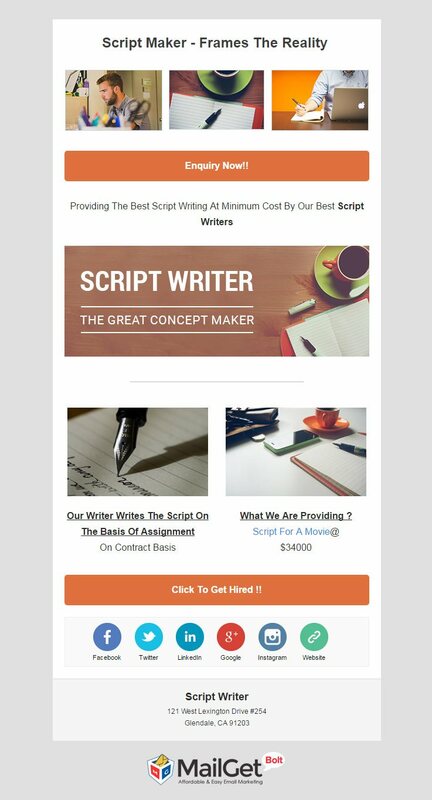 All the advertising writers and ad creators can promote their works globally by sending email templates to various subscribers and potential clients. This mass sending is possible only if your email list is healthy and contains genuine email addresses. This is achieved with the help of list management feature. 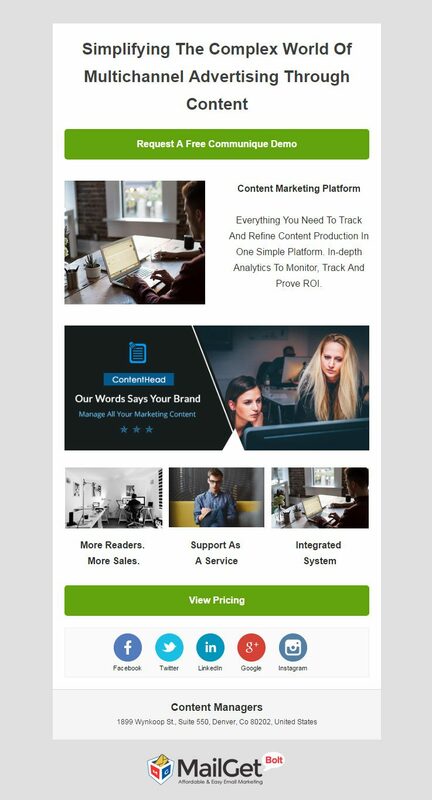 With the proper use of these email templates in your e-marketing campaign, you are bound to reach the new height of your profession. Also, you can design your personalized email template, according to your liking with the help of MailGet Bolt.